In a heavy skillet, saute' the onion, bell pepper, celery, and garlic in butter until tender; add sausage, ham, and chicken, and cook until heated through. Stir in wine, tomatoes, black beans, seasonings, and the bay leaves. Bring to a rolling boil. Cook rice in broth and serve jambalaya over the rice. Reduce heat, and simmer, covered tightly, until rice is tender and liquid is absorbed. Let sit 10 minutes before serving; remove bay leaves, and garnish with fresh cilantro or parsley if desired. Enjoy with a medium body white wine, such as Peach Creek Vineyards Aloha. Recipe adapted from several found on the internet, including Taste of Home Sausage Jambalaya. 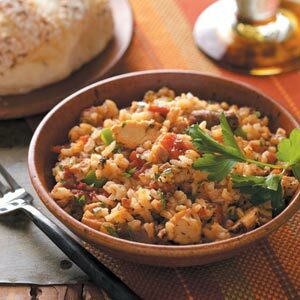 Sausage Jambalaya Recipe Photo by Taste of Home.